Take a look at our 12mm 6×36 stainless steel wire rope we stock and find out what is so special about this specific product. From the core options to the load capacity, this rope brings plenty to the table. The advantage of choosing this 12mm stainless steel wire rope with its 6×36 strand configuration is that you can handle up to 8,204kg with no safety concerns getting in the way of your productivity. This upper load capacity is for the independent wire rope core example. The fibre core version has a 7,605kg WLL, as well as a lower breaking force rating. You can view the full technical details further down this page, or get in touch with Rope Services Direct for any extra information relating to this product and its capabilities. We stock stainless steel rope which comes in a multitude of different strand constructions, so this 6×36 rope should be the starting point for your wire rope journey. Our 1×19 wire rope, for example, includes a 12mm diameter example that has a hefty 12 tonne capacity. The trade off in rigidity means that plenty of customers will prefer this 6×36 equivalent for its ability to flex. However, this is a good illustration of the variety you can find on our site. Give our sales team a ring on 01384 78004 and you can get all the expert advice you need to make sure you order the right wire rope. You can also reach us via email if preferred. 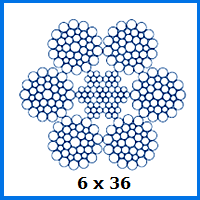 12mm 6x36 Stainless Steel Wire Rope Overall rating: 5 out of 5 based on 6 reviews.